Misplaced during 'external run-time' tidy, came back for it. That is an impressive chunk of rockery ! good,very good i like it. thank you. Beautiful work, thank you for sharing. Very interesting setting. Thank you. Hello to TheDuckPond ! Just forget the mention on the txt file... I forgot to change that part of the mention... You have all rights to use it both commercial or non-commercial ways... No problem ! theDuckPond (7 years ago) Inappropriate? Looks great but I haven't used it yet. I'm not sure of the License. On this ShareCG page it states "Usage Rights: Unrestricted use" but in the ReadMe that comes with the file it states "Usage Rights : Non-commercial use only." tomsen777 (7 years ago) Inappropriate? Lady Bree (7 years ago) Inappropriate? Belit (8 years ago) Inappropriate? alessandra (8 years ago) Inappropriate? ritter_markus (8 years ago) Inappropriate? 3DPeanuts (8 years ago) Inappropriate? 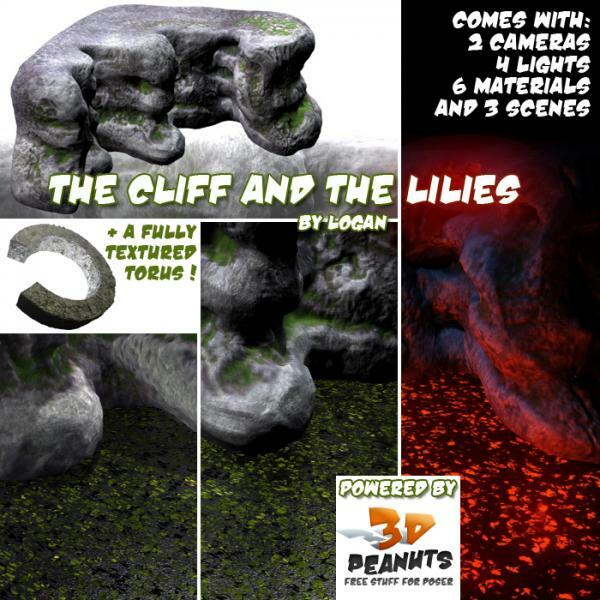 Thanks everyone and all apologies because this final update is more a new version of the previous package, i'm afraid it will be more safe to delete the old Logan folders before unzipping this one. But i hope it's worth the inconvenient. Thanks a lot, i'm actually working to clean and make the textures look better... it will be uploas soon as an update to replace the old ones ! I really like the shape of your cliff, looking forward to trying this in Poser, Thank you very much.